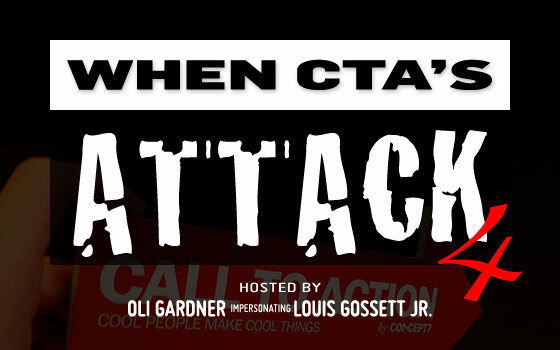 CTA’s (Calls to action) are everywhere. They attack (see how I made the headline relevant?) our senses, and play trickery & mind games with our emotions. Which is one of the reasons that most people have a hate/hate relationship with marketing and advertising. Next time you go for a walk, try to spend a little time in your customers shoes. Really read the messages you are confronted with, and see if you can learn a marketing lesson from that flashing neon sign you’d usually see as a giant pink pain in the a**. This is exactly what I did. I took my camera and went walkabout on a random mission to find CTA’s in the real world. Trying to find a connection between the clutter we see every day and the work we do as online marketers. 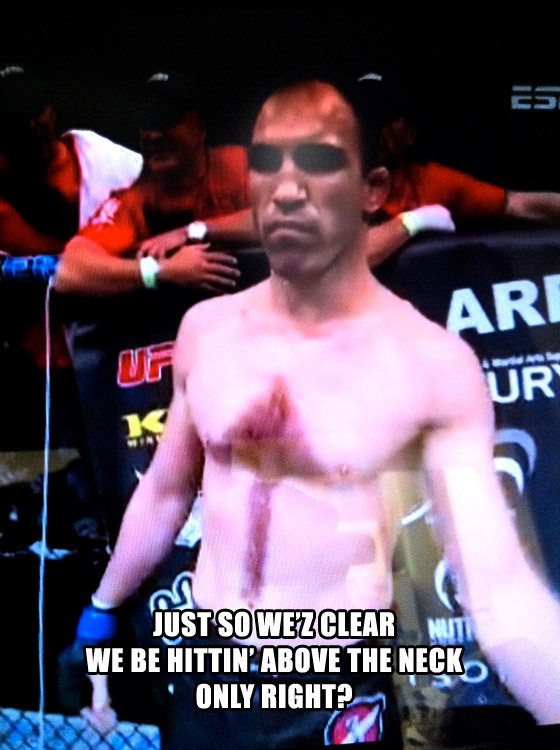 This UFC fighter either has a broken rib that he’s trying to protect, or he just loves being punched in the face. Either way, the target is clearly marked. Despite the stupidity of wanting to be punched in the head, you can’t argue with the effectiveness of this call to action. Using shaving design, the fighter has used a blatantly obvious directional cue (the arrow) to get what he wants. A brilliant piece of creative thinking. The wine store in question only recently started selling cold beer (and it’s buried inside a mall). Combine a sunny day with these tempting instructions and you have a recipe for sales success. Don’t forget the basics of matching supply with demand. In this case, a hot Sunday when liquor stores were closed created the demand. 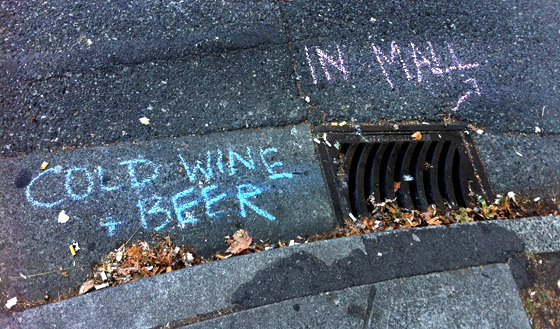 And some free – and very clever – guerrilla marketing, using just a couple of pieces of chalk, created a constant flow of new customers to a new supply of cold beer. To investigate further, I spent a few minutes in the store casually eavesdropping as I heard customer after customer delightedly explain how they “never knew this place even existed”. The position of the message was equally important. 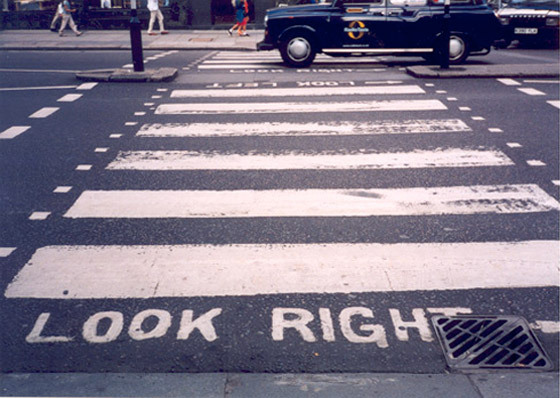 People have been trained to stop and look down at instructions before they cross the street (as shown in the example below), so this chalk message was perfectly placed to garner attention. Good luck figuring out the most important message here. Too many CTAs is a bad thing. The overwhelming clutter just makes you want walk on by. This is the real-world equivalent of how banner blindness came about. 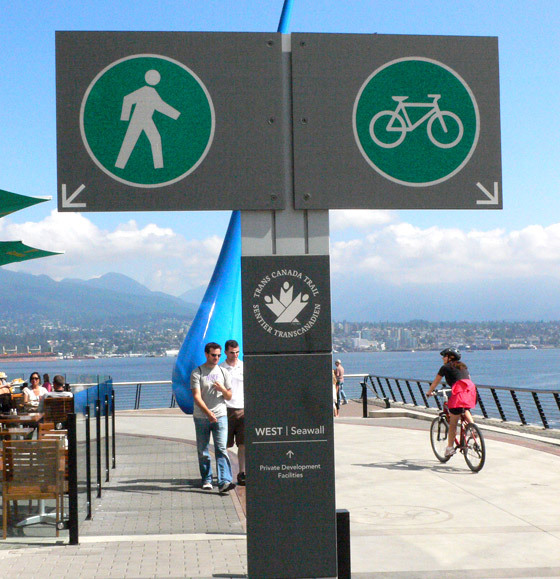 Here the signs clearly delineate where you should be going (walk on the left, cyclists on the right). Clear directional cues don’t even need writing. Powerful iconography or imagery is all that’s needed to segment incoming traffic to this area. It’s important to note that segmentation at the point of arrival isn’t enough for a great conversion experience. 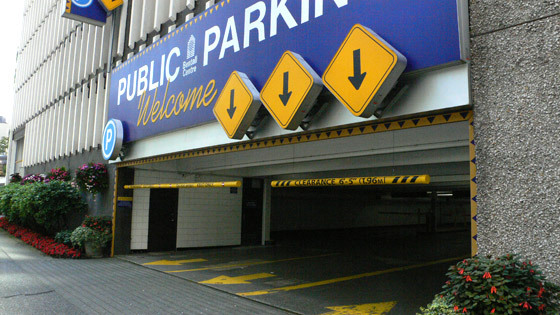 You still need to design the environment for each segment as shown in the photo below – taken near the same spot as the signs above. 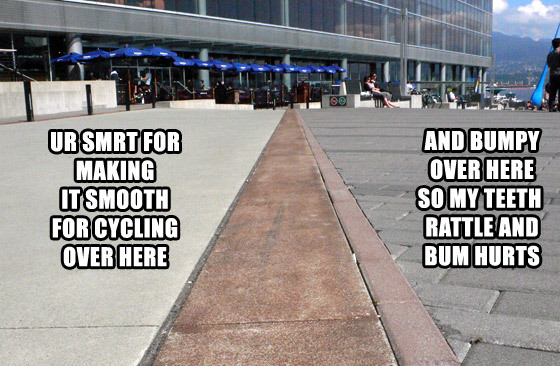 Physical design has been used to act as a sensory indicator of segmentation: cyclists who don’t see the sign would naturally move towards the smooth surface (away from the bumpy cobbles). This is a classic fire safety hazard blunder. People have been trained for years that handles mean pull and the bumper bars mean push to exit. Here they clearly put the doors on backwards. 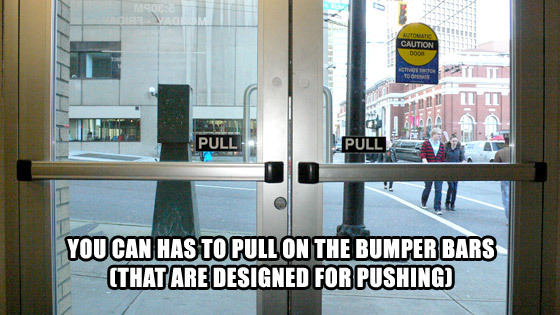 Asking you to pull the bumper bars is the opposite of their intended design – and watching people arrive at these doors for the first time can be quite entertaining. On the other side of the doors, it’s even worse. 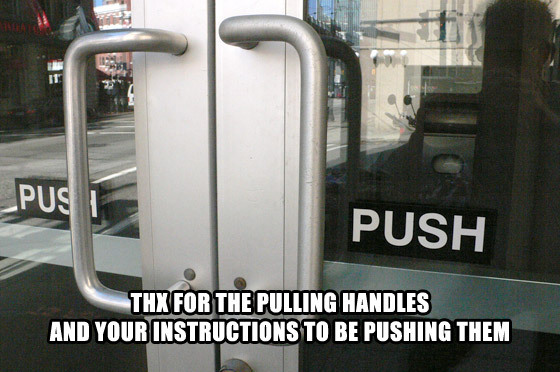 The handles are begging you to pull to open, but the sign (and mechanical setup) require you to push. Thtoopid thtoopid! This example highlights the importance of following established design standards, and making interactive devices behave as expected. In the online world, an example would be having text that’s underlined act as a link. It also teaches us that if you happen to make a construction error (like putting the doors on backwards), you should undo that error and start again, rather than just applying a band-aid solution (in this case – the conflicting written instructions). 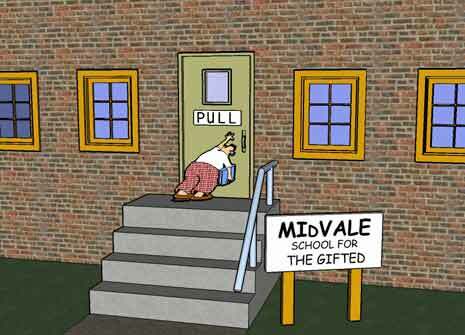 Doesn't matter how hard you push if the door opens outwards. In case you didn’t get the point from the first sign, there’s another one right next to it to reinforce the intent. People sometimes miss things, through banner blindness or impatience or because they are on a long page and your CTA was “correctly” above the fold. The point to learn here is that you often need to repeat your call to action – especially on a long page – to make sure people see it and know what to do next. It’s important not to drive head first into oncoming cars! 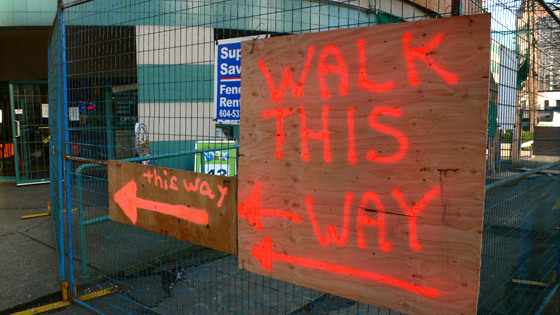 Waymarking signage helps make sure this doesn’t happen. 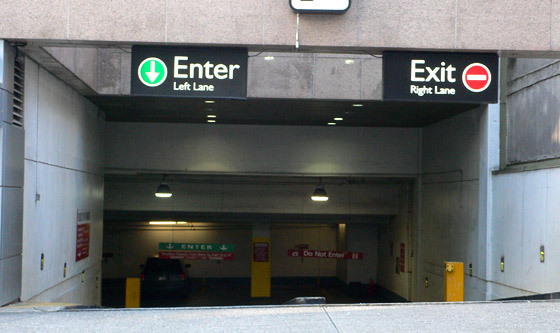 In this example, the entrance is clearly marked with big colorful arrows. In this example, they take an even more cautious approach, telling where to go and where NOT to go. Double points for this one. People can get lost of wander off without proper guidance. An online analogy would be comparing a homepage (which has many different points of interaction – leading to many user paths) to a landing page focused on a single purpose with a single clear call to action. To learn more about this concept, read “Can You Catch 4 Ping Pong Balls? – How Too Many Messages Can Kill Your Conversion Rate“. 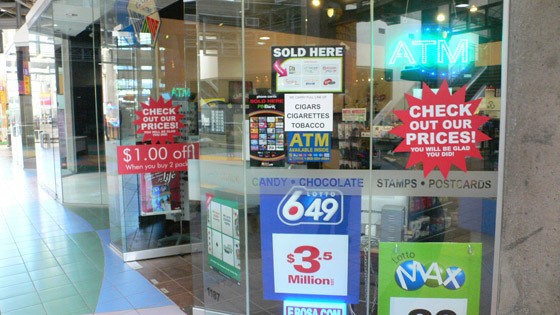 In this example, the shape of the sign acts both to inform us that the merchant offers a key cutting service, and also as a directional cue to draw you into the store. 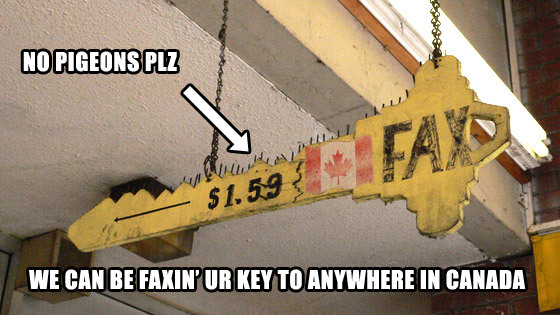 There is a little extra clutter added to mention their fax service, but they get away with it due to the strength of the sign shape. And a little discriminatory segmentation is thrown in to refuse entry to pigeons (the nails on the top edge of the sign). 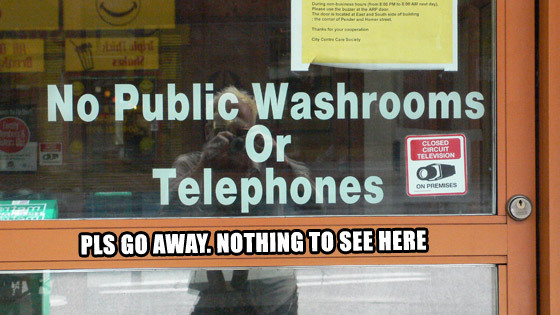 This location has clearly had to deal with a lot of people looking for bathrooms and telephones. By making a simple statement that they do not have these facilities, they will remove a lot of time-wasting foot traffic that would otherwise cross their threshold. Following seamlessly from the last example, this sign serves to guide people in the right direction, while preventing the problems seen in #8. The reason I call it a contextual CTA is that this sign is located in an area with Vancouver’s highest homeless population (which creates a demand for public toilets). There is usually a very small window within which to capture your visitors’ attention, which makes it critical that you have the right message (and call to action) in the right place at the right time. Online this is analogous to placing ads where people have a need for your product or service (context). Going back to the photo, the just-in-time aspect is very obvious – if you need to pee in a hurry and don’t know where to go, you’ll do one of two things: pee in the alley, or go into the nearest open store to ask if you can use their facilities. There’s also a trust factor to be explored here. In the context of the location described above, a tourist not knowing the area could feel intimidated to the point where they ignore the sign (and head for the nearest shiny mall). The sign below is a great example of how you can add a trust statement to encourage action. By adding the “clean and supervised” statement, this sign is more likely to persuade a passerby to go take a pee, than the sign without the trust statement. Now that’s conversion centered design! This is an example of using the wrong type of call to action. If I’m standing in front of a sign like this and I’m interested in what’s being sold, I can just walk into the store. Calling you on the phone would be borderline ridiculous (picture someone waving at the cashier from the street saying “Can you hear me now?”). And the address is even more silly – I’m already here, I don’t need your directions – use your banner space to give me some real value. 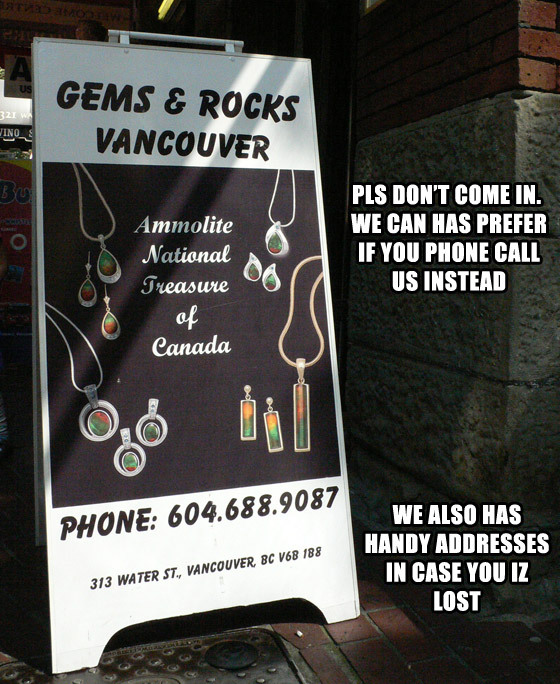 In this instance, capture the interest of the passerby with the sign, have an enticing statement to bring people into the store, and add a box of fliers to the sign for those that are interested but without time to shop (a secondary call to action). Never waste your ad space with a useless CTA. Online, you have the opportunity to test and refine your ads until they perform – don’t just set it and forget it.